The dosh is counted ! two crab claws, 6 oz of seaweed, and half a bucket of sand. THANK YOU AND WELL DONE ALL ! The Fishermen & Firemens Boxing day football match is Scarborough's oldest surviving custom - according to written evidence. Whereas, annually from 1893, there are written reports of the Fishermen & Firemens Football match. Originally held on Xmas Day it was changed to Boxing Day in 1898. Still played on Boxing Day, on the South Bay Beach, the football match is a major fund raiser for the Fishermen & Firemen's Charity Fund - Which provides much needed help for the elderly & infirm during the winter months. Other events on Boxing Day include the Mile of Pennies and the Raft Race held in the harbour. Also throughout the year with raffles and charity evenings. The Charity was originally started to help the widows and orphans of the five Scarborough fishermen drowned at sea aboard the Evelyn and Maud. The Evelyn and Maud was a 55 ton ketch-rigged sail powered trawling smack. Built in 1873 by Scarborough ship builder, Thomas Wilson Walker, whose shipyard was on Sandside opposite what is now the Newcastle Packet pub. Built for major Richard Francis Chaplin, her registration number was SH 445 and she was named after Evelyn and Maud Appleby, Daughters of John Appleby, Who was her first skipper. Throughout the 19th century, numerous fishing smacks, yawls and cobles belonging to Scarborough's Fishing fleet were lost at sea during stormy weather - seldom were any of their crews saved from a watery grave. Most of those disasters were virtually forgotten, except in the pages of maritime history. However one is commemorated annually at Scarborough with the popular Boxing Day Charity Event - a custom which originated way back in 1893. On Thursday morning, 16th November 1893, 20 Scarborough trawling smacks set off for the fishing grounds, 14 of them going North to Scottish waters, the remainder going South to Flamborough Head. Suddenly, without any warning a terrible storm blew up at midnight on the 17th November, causing heavy seas and exceptionally high tides. Several sailing vessels carrying cargo were wrecked in the North Sea - three of the in Scarborough's South Bay. Local Owners feared for the safety of their trawlers fishing in the North Sea - local families feared for the safety of there relatives aboard those vessels. But, by Saturday 25th November, all the trawling smacks had returned home except the Evelyn and Maud. When she set sail on the 16th November, her skipper John Francis Reynold, was indisposed so his place was taken by William Mann, an experienced trawler skipper who had been without a berth for several weeks. The Evelyn and Maud had sailed to Flamborough Head fishing grounds where she was seen trawling at 4.30pm on 16th November by the crew of the Scarborough trawler 'Spy' (SH 135). Evidently, the storm did not hit that area until noon on 18th November. When it did, Ephriam Howard, skipper of the 'Spy', decided to abandon fishing and make for Scarborough before the storm worsened. Ahead of him on the homeward journey were several trawling smacks, one of which he presumed to the the Evelyn and Maud. During the next 5 days, extensive inquiries were made at east coast ports for news of the missing smack. Then, on 30th November, a telegraphic message from Hartlepool stated the Evelyn and Maud was probably run down off Flamborough Head, on 18th November, by 'Ardross', a three-masted sailing schooner. On Saturday 2nd December two life buoys - each bearing the name Evelyn and Maud and registration number SH 445 - were washed up at Easington, near Spurn Point. Amongst wreckage entwined around one lifebouy was a piece of bone on which had been scratched - in writing recognised as that of William Mann - the words, "Ship going down, Sinking fast. Evelyn and Maud". Daniel Reeder (21 years) - Second Hand, 10 Dog & Duck Lane. Richard Whitaker (23 years) - Third Hand, 16 East Sandgate. John Eaves (58 years) - Deckhand, 10 Batty Place. Holding informal inquiries amongst themselves, many Scarborough fishermen decided the Evelyn and Maud had probably capsized - while trawling in strong winds and a rough sea - because her beam trawl net had become entangled with some immovable obstacle on the sea bed. Their sensible theory might well have been correct because the running down claim was disproved during a Board of Trade Inquiry, held at Hull on 21st and 22nd Feb 1894. Despite John Reynolds' Efforts to prove the 'Ardross' wrecked his father's trawling smack. The inquiries Jury declared: "Evidence given at this inquiry proves beyond all doubt the the 'Ardross' was NOT in collision with the Evelyn and Maud. The 'Ardross' infact collided with the 'Confidence' of Grimsby"
A Memorial Service was held at St Marys Church on sunday 3rd December 1893 for the five men lost at sea with the Evelyn and Maud. To help the widows, Edmund Reynolds paid the drowned men's wages up to 2nd December. Then, assisted by Councillor Joseph Hopwood, he launched the 'Evelyn and Maud Fund' to raise money to help the bereaved families. 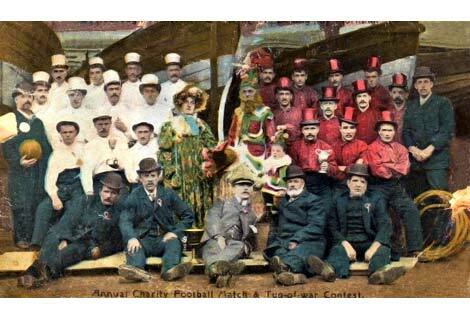 Various events were held including the now famous Football Match between the Fishermen and Firemen (Firemen being the stokers from the steam trawlers) of Scarborough's fishing fleet. By 1900 the Evelyn and Maud Fund became the Fishermen and Firemens Charity Fund and to this day it continues to raise funds to support local needy people such as the elderly by giving them food vouchers to help them through winter. So come along and support your oldest local charity and enjoy Scarborough's UNIQUE Boxing Day!